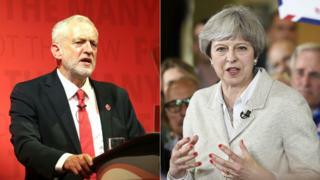 Labour has accused the Conservatives of putting “vitriolic personal attacks” at the heart of their election campaign. Ahead of a Westminster debate on the abuse faced by MPs, Labour claimed the Tories had run a “negative, nasty campaign” targeting shadow home secretary Diane Abbott in particular. It comes after Theresa May suggested Labour leader Jeremy Corbyn had not done enough to condemn abuse. The PM has called for parties to unite against “bullying and harassment”. Since last month’s general election, attention has focused on abuse suffered by MPs from across the political spectrum, including Tory Sheryll Murray who said she had faced social media comments like “burn the witch”. On Saturday, Labour MP Yvette Cooper said some of her party’s supporters had targeted female Conservative MPs – as well as Labour members – with “vitriolic abuse”. But ahead of the Parliamentary debate, Labour has levelled accusations against the Tories in a letter to Conservative Party chairman Sir Patrick McLoughlin from his Labour counterpart Ian Lavery and Cat Smith, shadow minister for voter engagement. “Parties and politicians have a responsibility to set an example, by treating others with dignity and respect, including those with whom we strongly disagree,” they wrote. “The Conservative Party has instead promoted personal attacks as a core component of its national campaign. They claimed Labour “fought a positive, hopeful campaign” and insisted that all its MPs ran campaigns based on its policies rather than personal attacks. On Monday, Mrs May – asked whether Mr Corbyn was doing enough in response to complaints of intimidation – said she was “surprised at any party leader who’s not willing to condemn that”. Conservative Simon Hart has secured Wednesday afternoon’s Westminster Hall debate on “the abuse and intimidation of candidates and the public in UK elections”. Speaking on the BBC’s Daily Politics on Tuesday, Mr Hart said there had been a clear change in attitudes towards MPs and campaigners between the 2015 and 2017 general elections. People wanting to publicly support candidates were being “driven away from politics at a time when we need them” he said. “This extends way beyond the so-called bullying of MPs, this is about online bullying generally,” he said, claiming there had been a “deafening silence” from political leaders. Mr Hart claimed the emergence of Jeremy Corbyn-backing grassroots organisation Momentum had played a “significant part” in this shift. But Momentum dismissed his accusation as “baseless”. “If we are going to tackle the abuse MPs from across the political spectrum face, Simon Hart and other Conservative MPs should stop making baseless accusations for which they offer no proof, and instead think about how we can work together to find a solution,” a spokesman for the group said.